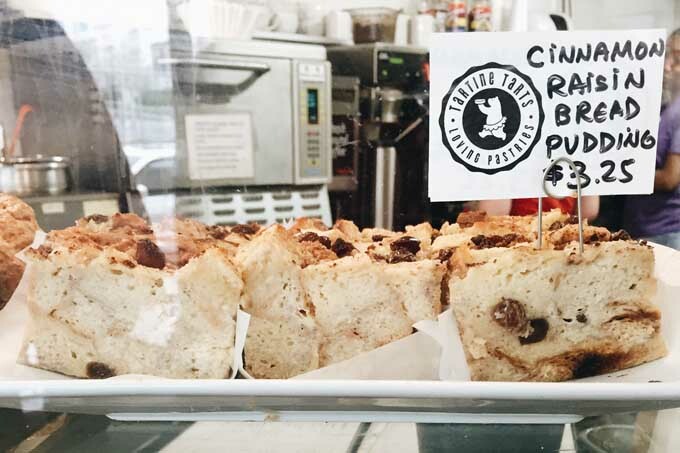 A hidden gem in Abbotsford is The Polly Fox, the city’s only dedicated gluten-free bakery which opened last year. Open for breakfast, lunch and weekend brunch, you’ll find 100% gluten and allergen-free baked at The Polly Fox. This past week, I had the opportunity to visit The Polly Fox and learn more about their story. Disclosure: This is a media visit where all food and drinks were complimentary. The two girl bosses behind The Polly Fox are Kelsey Krahn and Kaitlin Simoes who are real-life sisters-in-law. 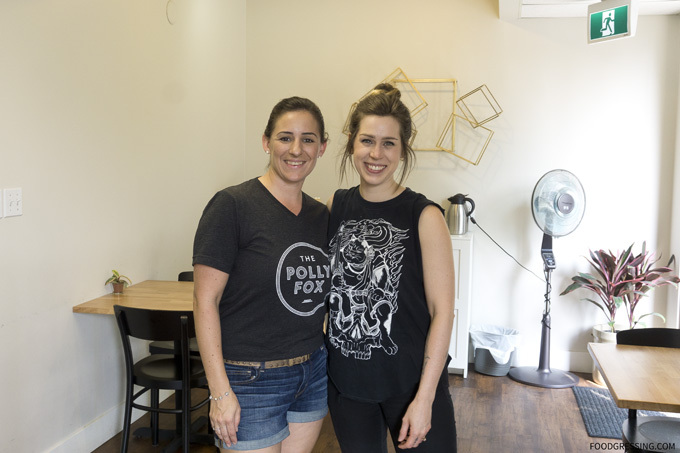 Kelsey, who is Celiac, was inspired to start The Polly Fox – a place that offers worry-free fare to those who are also Celiac or suffer from peanut and soy allergies. The interior of The Polly Fox is clean, warm and inviting. 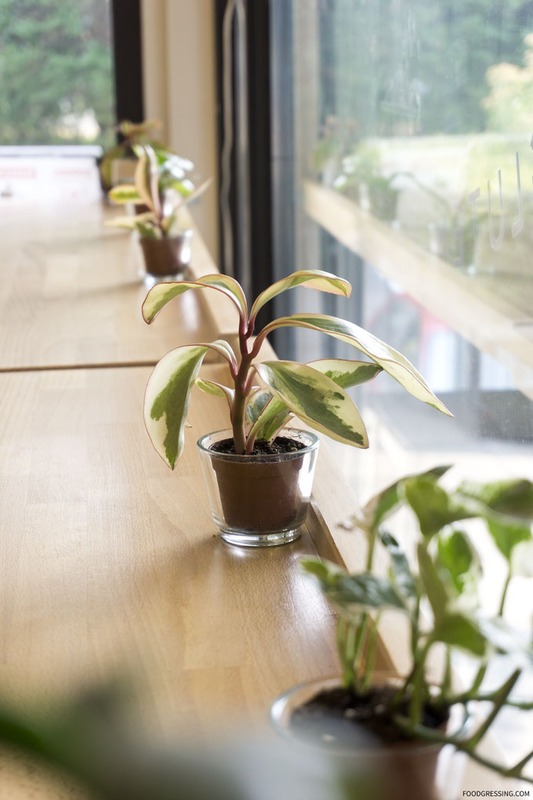 There are tables along one side of the cafe, seating along the window, and tables outside. My friend, Sonia, and I enjoyed a late morning coffee break on their patio. For drinks, we had the Rosewater Almond Latte and Spanish Latte. A few of the treats we tried were the Vegan Donut, Vegan Chocolate Chip Cookie and Vegan Cheesecake and Lemon Bar Mini. The Rosewater Almond Latte was just subtly sweet with some nutty flavours and a hint of rosewater. The Spanish Latte had full fat milk with a touch of sweetened condensed milk, steamed together; it was lusciously creamy and sweet. The Vegan Cheesecake was heavenly and I highly recommend it. It was a creamy vanilla cashew cheesecake with a shortbread graham cracker crust and topped with a roasted strawberry swirl. 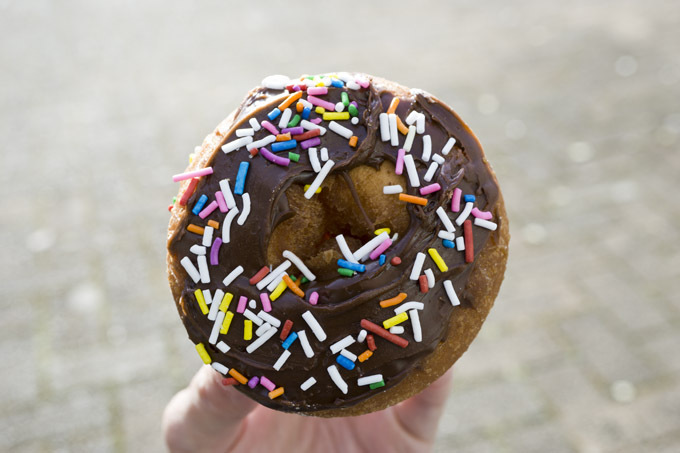 Donut lovers would be impressed with the Vegan Donut which was light, fluffy and delicious. As a fan of lemon desserts, I quite enjoyed The Polly Fox’s lemon bar mini with a shortbread crust. 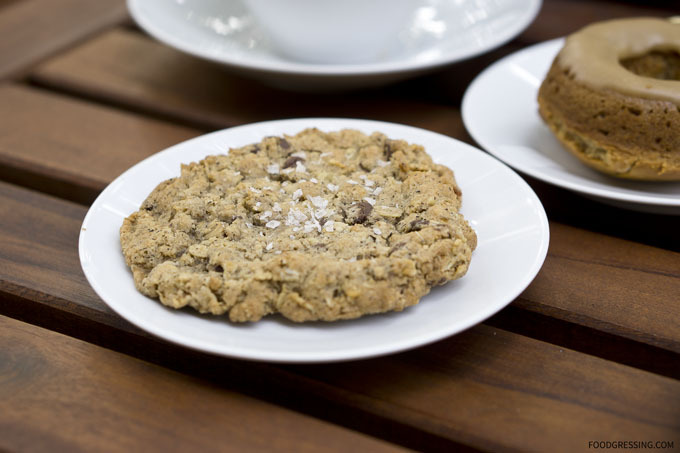 The Vegan Chocolate Chip Cookie was nicely chewy and had a great chocolatey flavour. 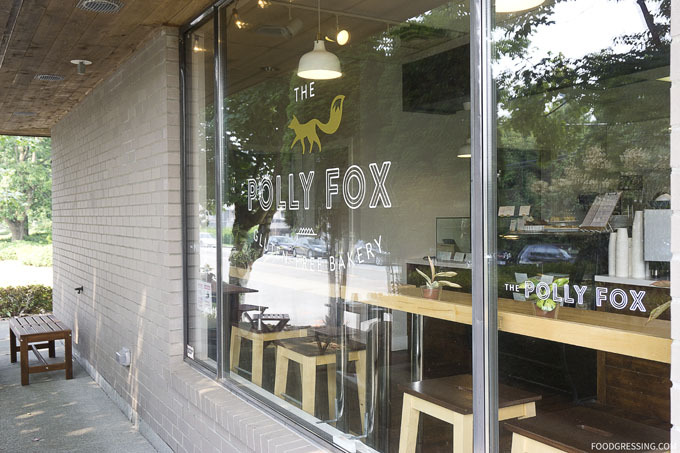 I love the Polly Fox’s cozy, warm and community-oriented vibe. My favourites were the Vegan cheesecake and Lemon Bar Mini. 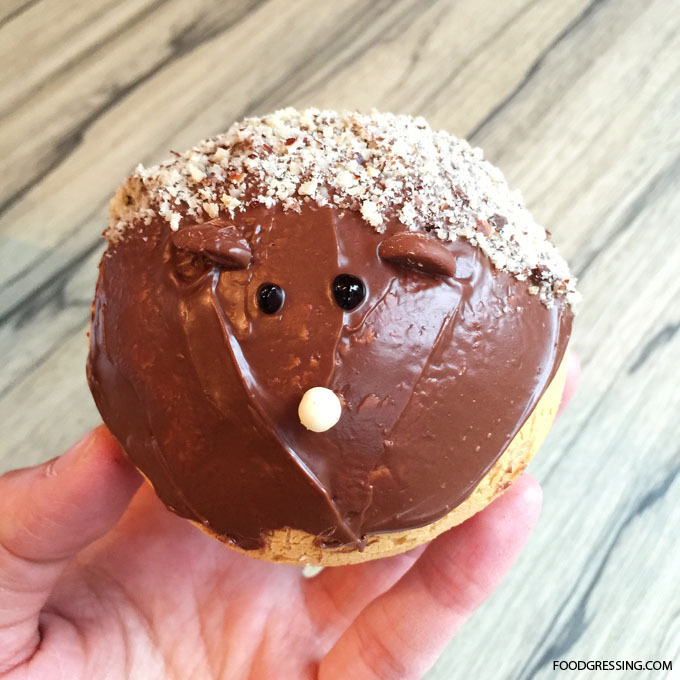 I’ve only been to one dedicated gluten-free bakery ever and I found The Polly Fox’s treats to be better than what I have tried elsewhere. This winter, The Polly Fox is moving to a bigger and better space on Essendene Avenue (still in Abbotsford). But for now, you can find them at 33477 Mayfair Avenue. 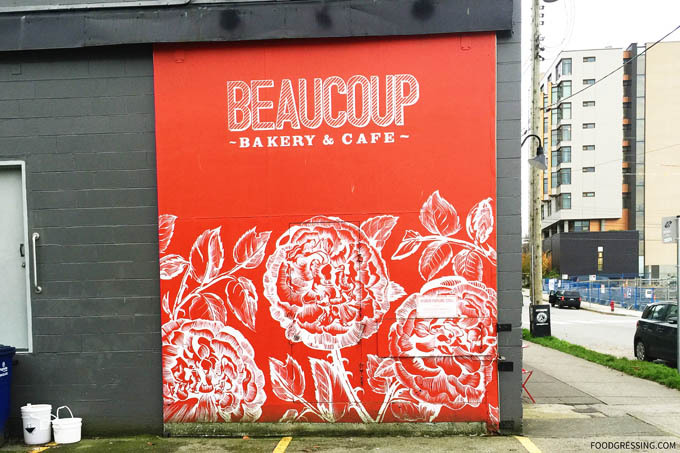 When it comes to top bakeries in Vancouver, Beaucoup Bakery is certainly one of them. 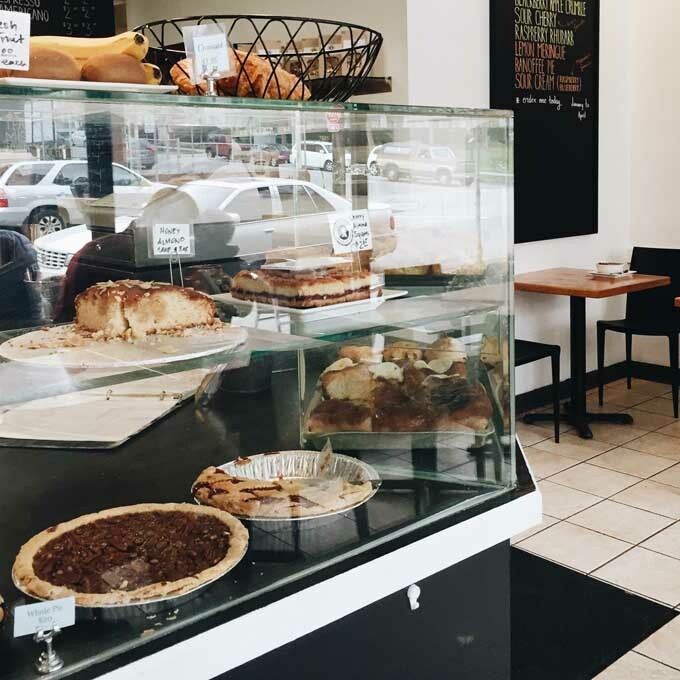 Since opening doors in 2012, Beaucoup Bakery has received much acclaim from the foodie community. 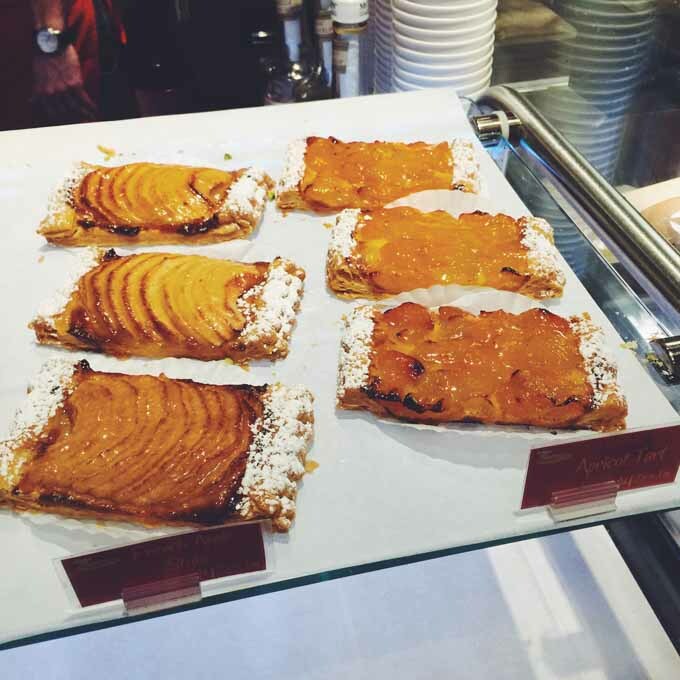 Serving French-inspired pastries, childhood favourites with some twists, and scrumptious croissants, Beaucoup brings a bit of Paris to Vancouver. 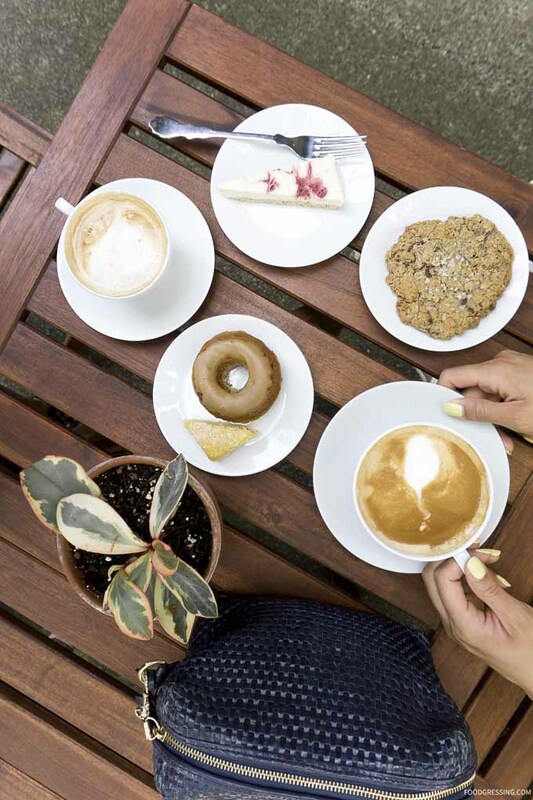 After a busy day recently, my husband and I visited Beaucoup for a much needed coffee break. 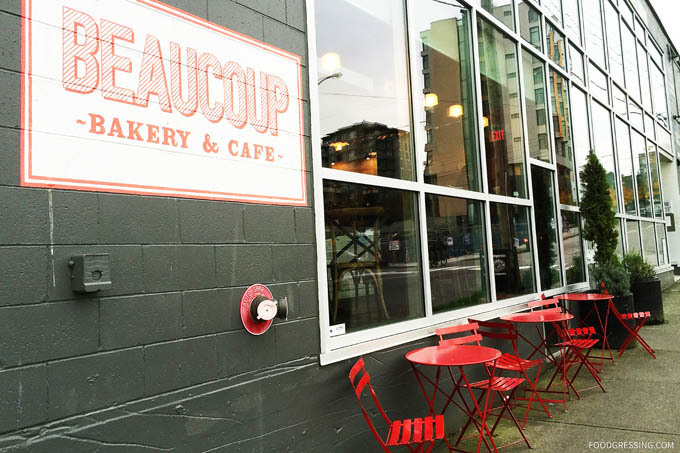 Located at 2150 Fir Street in South Granville, Beaucoup Bakery is a small, stylish and modern cafe. There are a few free parking spots on the side of the cafe next to their beautiful red and white florale murale. Otherwise, it’s paid parking in the area. There are several dining tables inside the cafe as well as a counter along the window overlooking the street. If it’s a nice day, you might just want to get a seat at one of the three coveted red tables outside. The cafe is also located across a small park which would also make a nice spot to enjoy food and coffee. Coming in late in the afternoon, I was expecting choices to be limited. The tarts were mostly gone but croissants were fortunately plentiful. Coffee at Beaucoup is by 49th Parallel. We ordered a cappuccino ($3.75), a large drip coffee ($2.50), a croissant ($3.00), a pain au chocolat ($3.50), and an apple tart ($5.50). 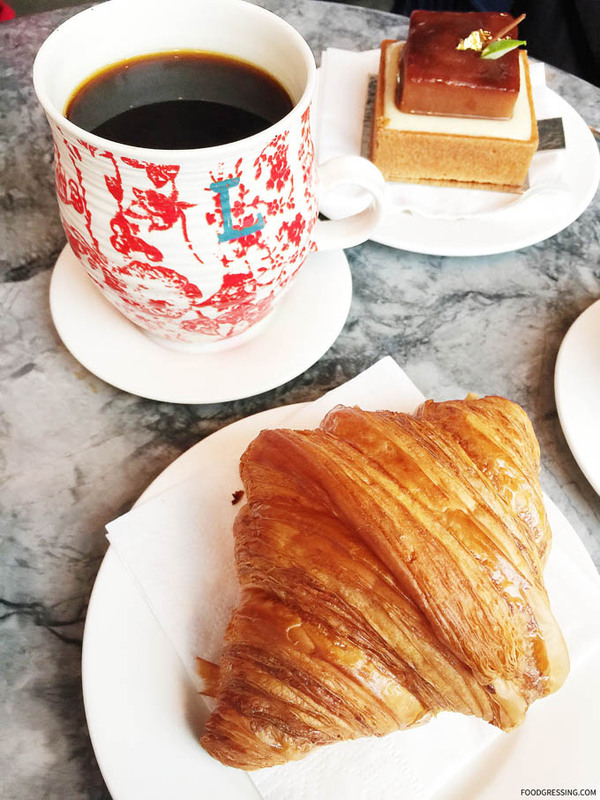 The croissants by Beaucoup are stuff that dreams are made of. Buttery, flaky, golden brown – these croissants were top notch and totally addictive. I liked how the croissants did not leave much grease on your hands. And when you first bite into them, there is that wonderful crunch sound. 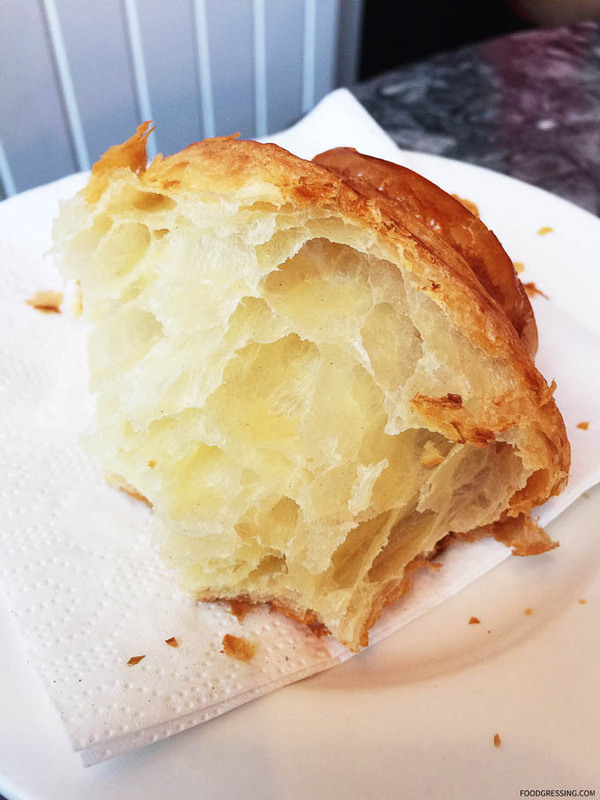 Just look how beautifully airy the croissant is on the inside. Glorious, I say. The apple tart was also an outstanding dessert made with apple purée, vanilla bean cream in a sweet tart crust. It was wonderfully complex and delicious. 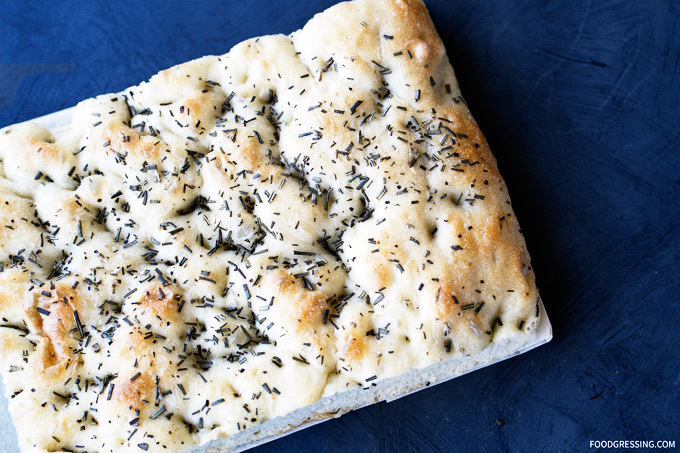 First, the crust is just crazy good – buttery, rich, light, crisp and cookie-like. That is filled with a luscious and silky vanilla bean cream. It’s the real deal as shown by the vanilla pod seeds. To top it off is a layer of apple purée that is smooth and has a slightly sour taste. I really enjoyed the different tastes and textures in this tart. Disclaimer: Only the mango deluxe cream puff and coffee were complimentary. All opinions are my own. It has been nearly a year since I last visited Chewy Junior Vancouver. 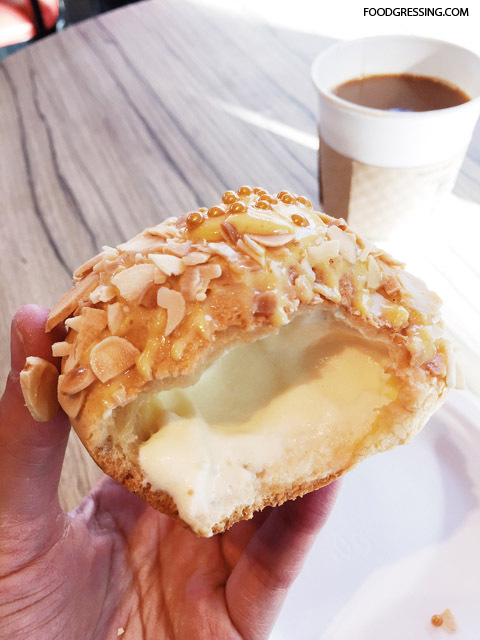 Recently, Zomato and Chewy Junior partnered up to offer a select number of Zomato contributors a complimentary cream puff and a coffee. I decided to take up the offer and visited Chewy Junior this past week. Chewy Junior originated in Singapore and this Vancouver location is their flagship store in North America. 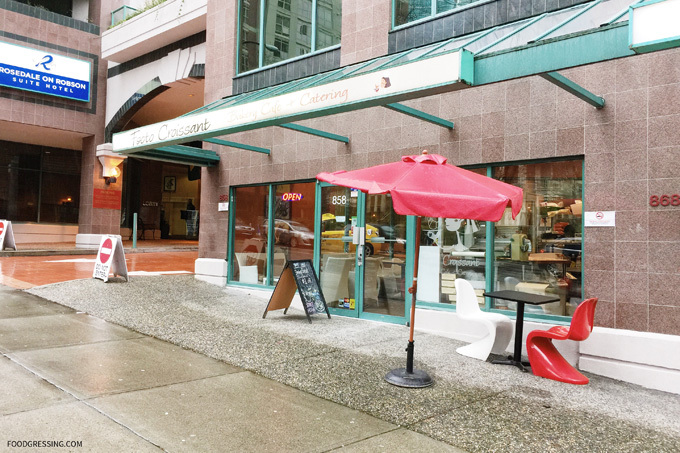 They are conveniently located near the Waterfront Station just outside of Gastown on West Cordova. 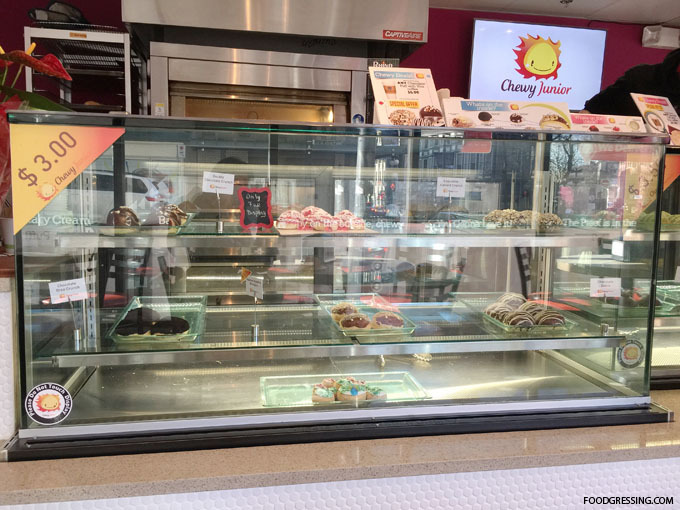 At Chewy Junior Vancouver, puffs are fresh every day on-site. It appears that the prices have gone up since I last visited, now ranging from $3.00 – $3.75 plus tax. There are a variety of cream puff toppings like chocolate almond crunch, strawberry cheese, and almond sweetheart to name a few. They have three main fillings: vanilla, chocolate and matcha. In the past year, I feel like I have gotten to know cream puffs a bit more. I made them in two different pastry courses and I have tried the ones from Beard Papa’s. I had previously tried the double chocolate crunch and matcha nippon. This time, through the Zomato offer, I got the mango deluxe. I also bought a second item, which was “Finnegan” – a hazelnut hedgehog. The shells of Chewy Junior’s cream puffs are chewy like a mochi which differs from Beard Papa’s more buttery and flaky shell. The fillings felt chilled, tasted fresh and were not very sweet. I admit that eating the cream puffs was a bit messy. After I bit into them, the cream was just spilling out. Napkins were my best friends at that point. I had to slurp a lot of the cream in order to contain the mess. The mango deluxe had lots of almond toppings which provided a fun, crunchy texture. I didn’t like the fondant pearls, however, because they were too hard. They were too much of a contrast to the soft filling. The hazelnut flavour had a nice subtely sweet chocolate flavour. 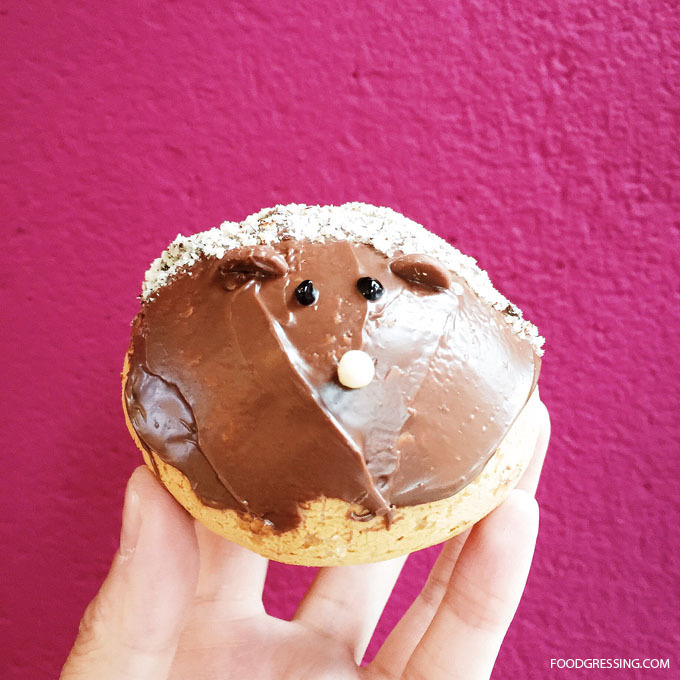 For more on Chewy Junior, visit their website or social media (Facebook, Twitter, Instagram). When I took a pastry class last October, the chef instructor told us that croissants are meant to be eaten right when they come out of the oven. 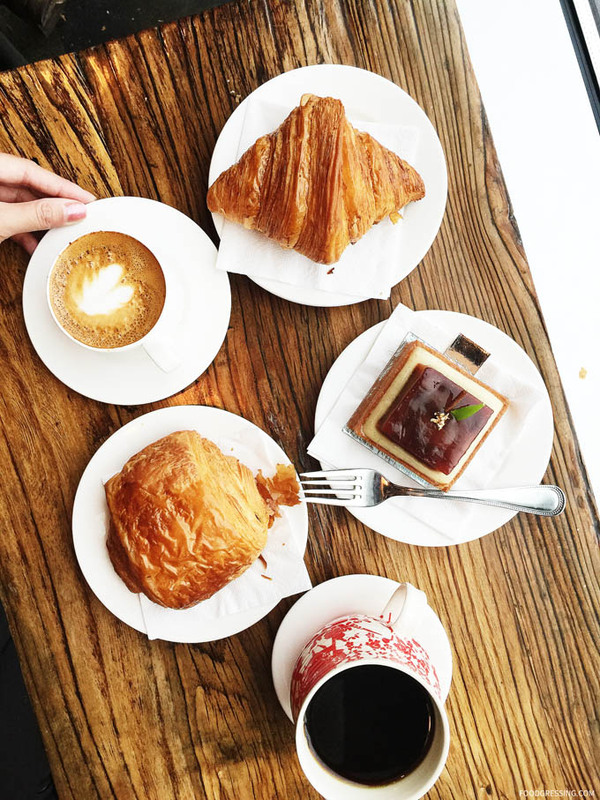 FOOTO Croissant is one place in Vancouver where you can eat fresh croissants made from scratch in-house daily. 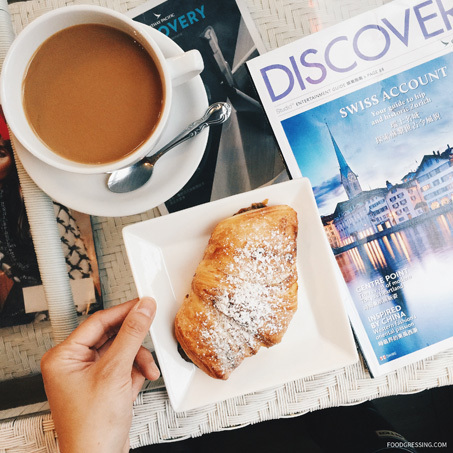 I ventured to FOOTO Croissant a few times recently to indulge in their delicious croissants. 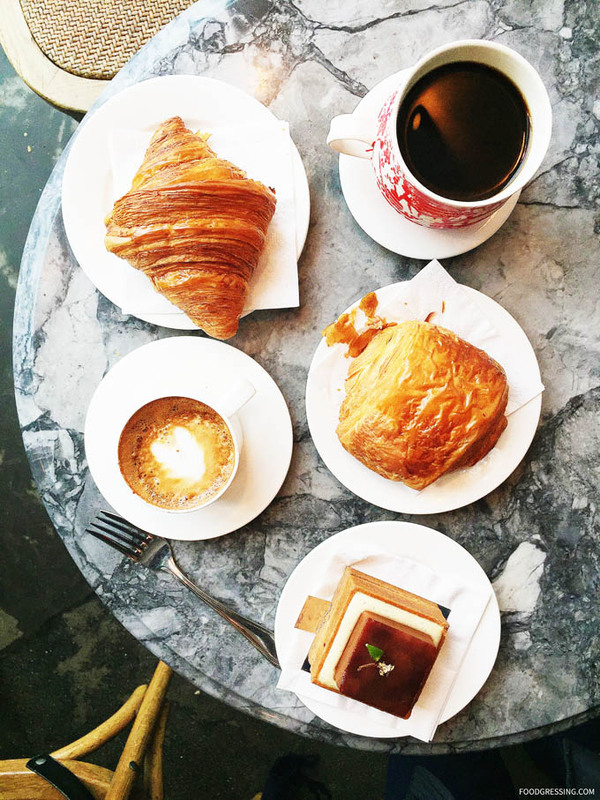 At FOOTO, croissants are baked five times daily (7:30 am, 9:30 am, 11:30 am, 1:30 pm and 3 pm). The baking times are, however, approximate. I can attest to that because I went to FOOTO at 11:20 am and the next batch was apparently not 11:30 am but closer to 1 pm. 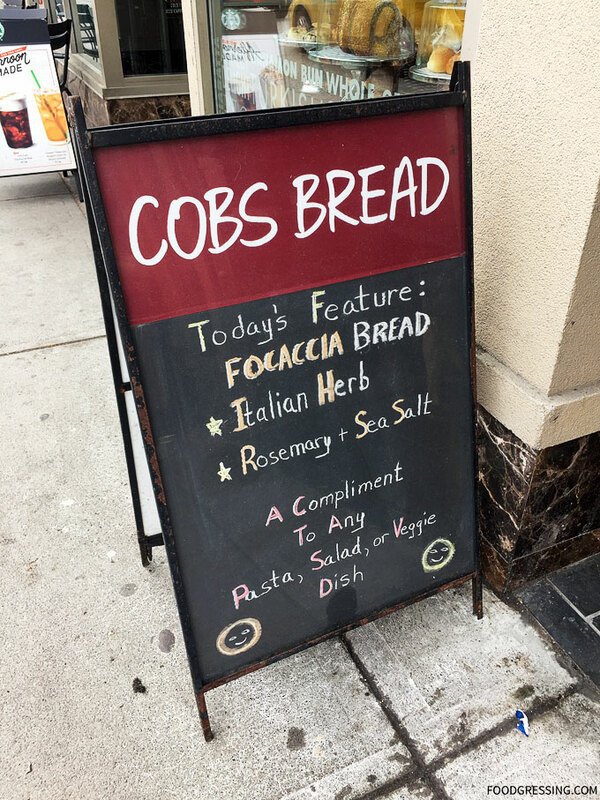 According to their website, they are committed to using only the freshest natural ingredients – enriched unbleached flour, water, unsalted butter, fresh eggs, fresh milk, salt, fresh yeast, and granulated sugar. No food colorings, chemicals, or shortenings are used. 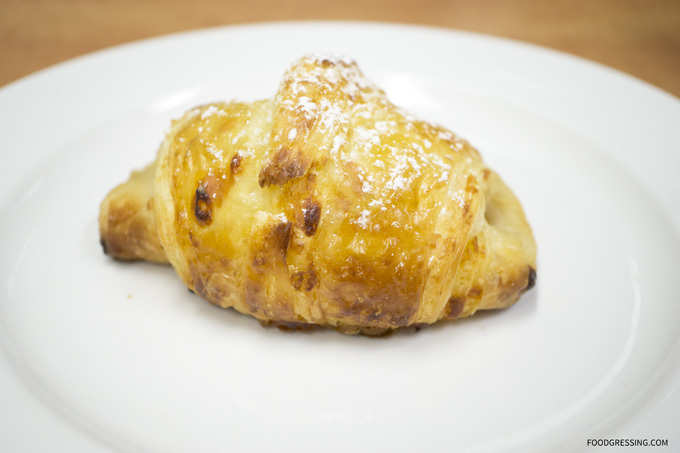 Each croissant is $3.20/piece, $15.00/6 pieces and $28.80/12 pieces. There is no tax on the purchase of 6 or more. 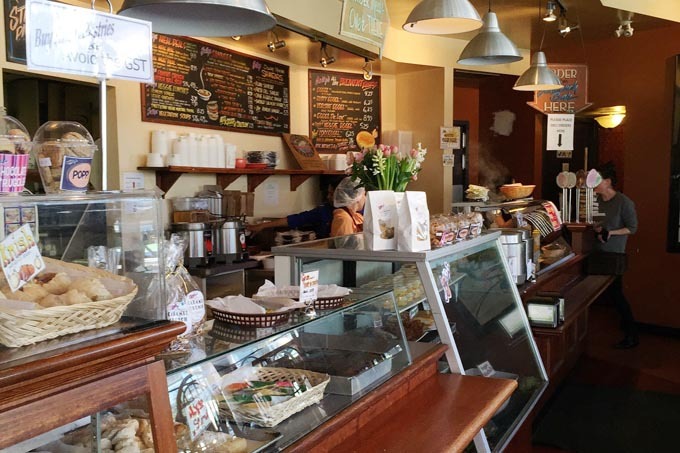 Aside from artisan croissants, FOOTO also has sells sandwiches, home made soup, coffee, tea, and macarons. Their menu is available on their website. 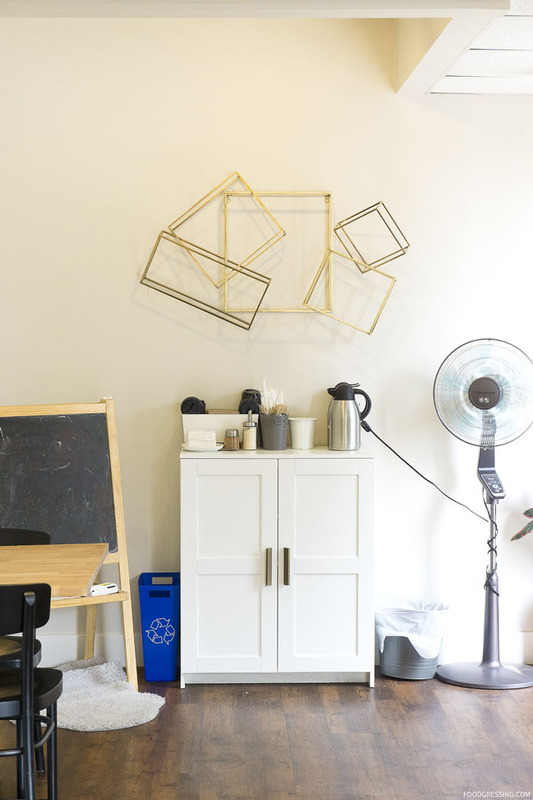 The interior of FOOTO is clean and contemporary with a mix of dining tables and benches with coffee tables. The dining tables did seem a little crowded together. 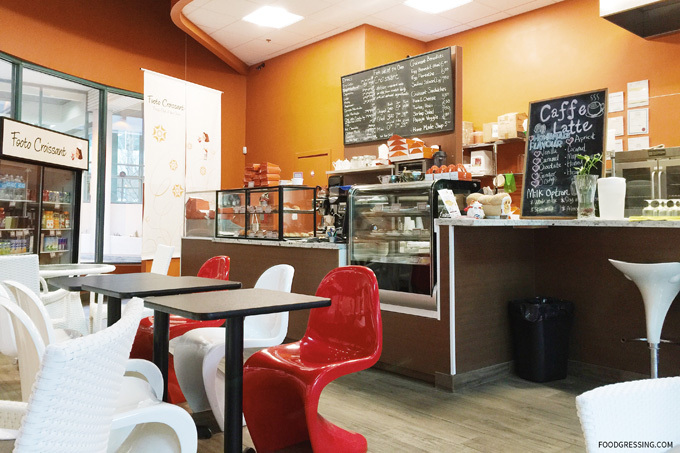 The design is more reminiscent of an Asian cafe rather than Parisian boulangerie. The places seems to be on the quieter side as it was pretty empty the times I was there. Most people seemed to take away the croissants rather than dine-in. The croissants were reheated prior to consumption. 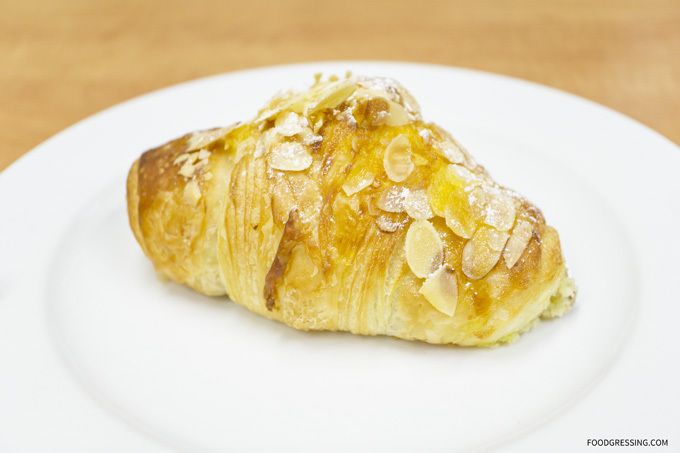 I have tried the almond, chocolate, apple cheddar and their newest flavour, Earl Grey croissant. All of the croissants were absolutely scrumptious. The colour of the croissants were nicely golden brown. The shells were indeed crusty on the outside, but the inside was soft and airy. The croissants held well together and did not give out much crumbs. Out of the four croissants I tried, I would highly recommend the apple cheddar. A bit sweet and savoury which gives it a fun flavour. 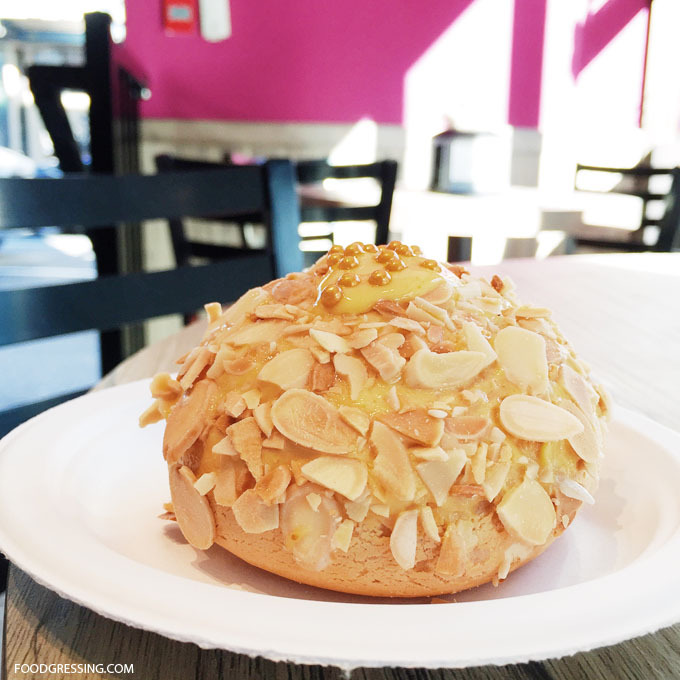 The almond croissant is filled with almond cream and topped with house made fruit glaze, toasted almond slices, and icing sugar. 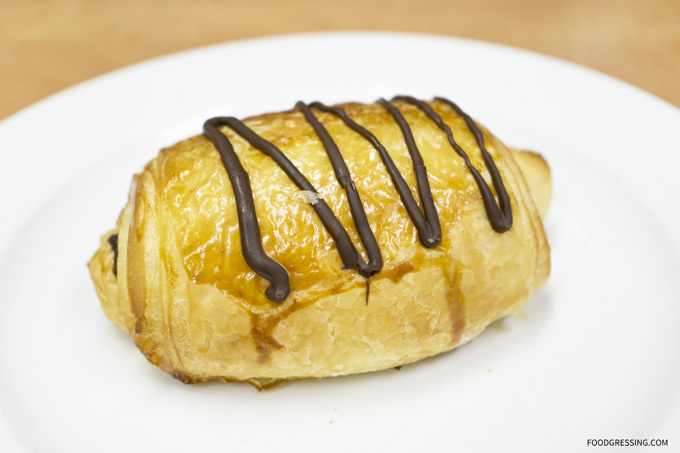 The chocolate croissant is wrapped around two dark chocolate sticks with melted chocolate drizzle on top. I enjoyed the Earl Grey too but would have liked the Earl Grey flavour to be stronger. 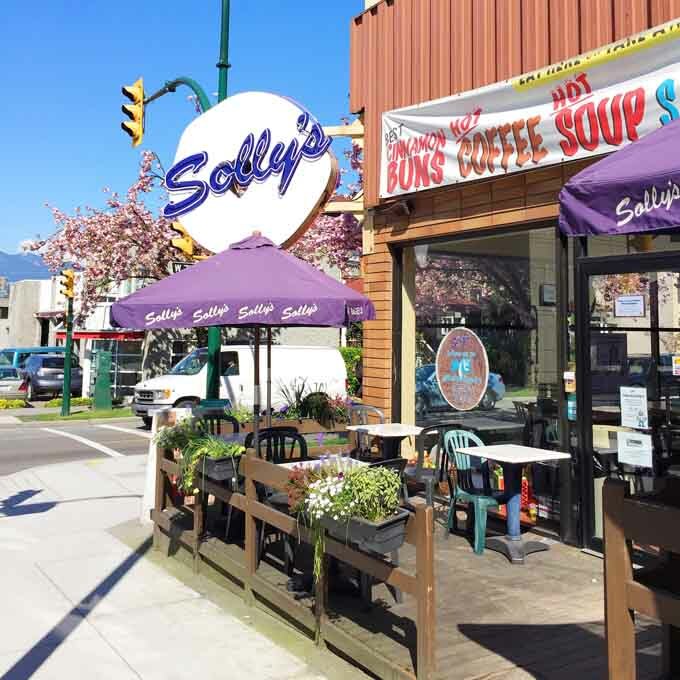 Solly’s Bagelry has been serving customers in Vancouver since 1994 and is one of Vancouver’s go-to places for bagels. This cute little Jewish bakery has quite a selection for a deli menu, which consists of an all-day breakfast, sandwiches and soups. 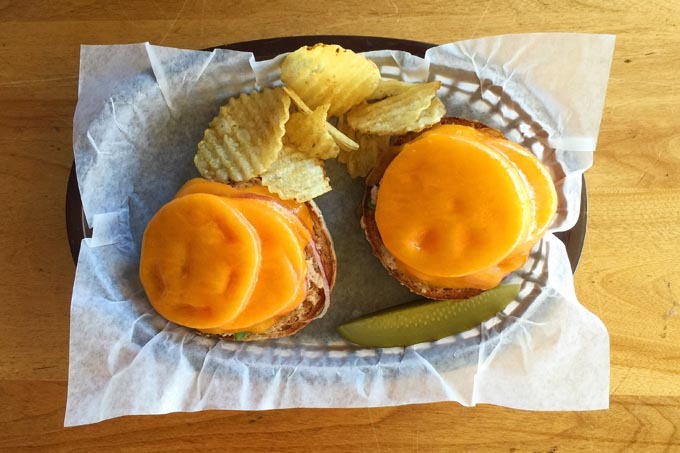 Their signature “Brooklyn style” boiled bagels can be prepared as “Eggels” with cheese, eggs and choice of toppings. For people on the go, you can simply get Sally’s Shmears – bagel and low fat cream cheese with choice of flavours. 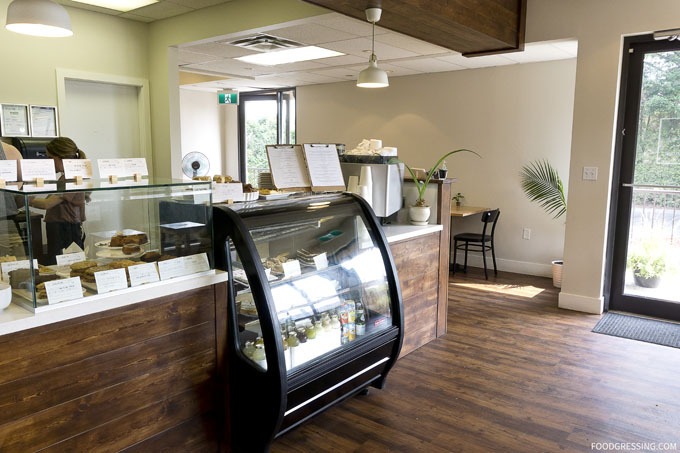 Sandwiches and soups round out the menu, but they offer an extensive variety of fresh baked goods and baked goods that you can take home too. Tip: you order from the right of the counter, pay on the left, and food is brought out to your table. 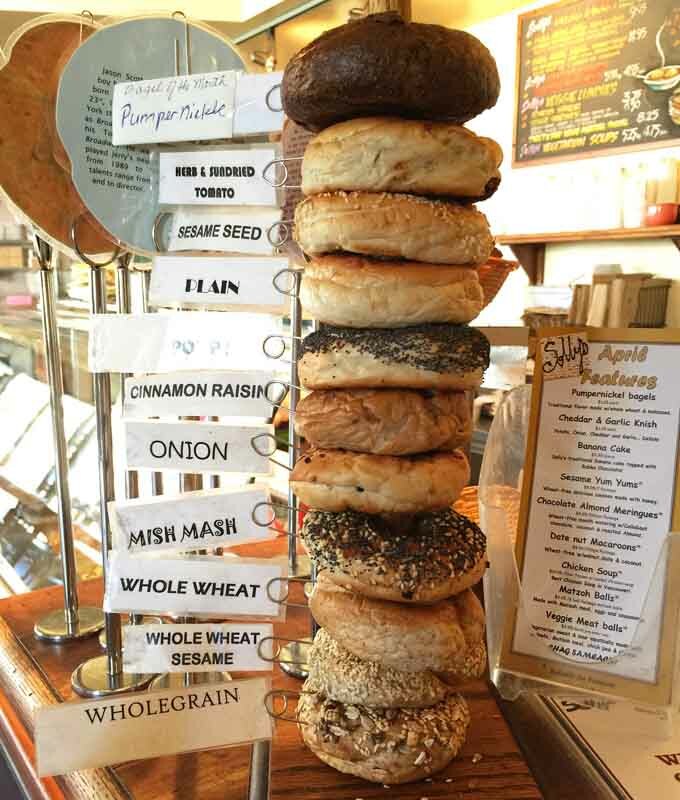 When you approach the counter, you see a tower of bagels showing you the types of bagels they have. Interesting flavours include pumpernickle, herb and sundried tomato, and “mish mash.” I find that their bagels are chewy and quite delicious. I’ve tried their sammies which included a bagel with tomatoes, onions, sprouts, chips and a kosher pickle spear. The Lox & Cream Cheese ($8.95) was so good. 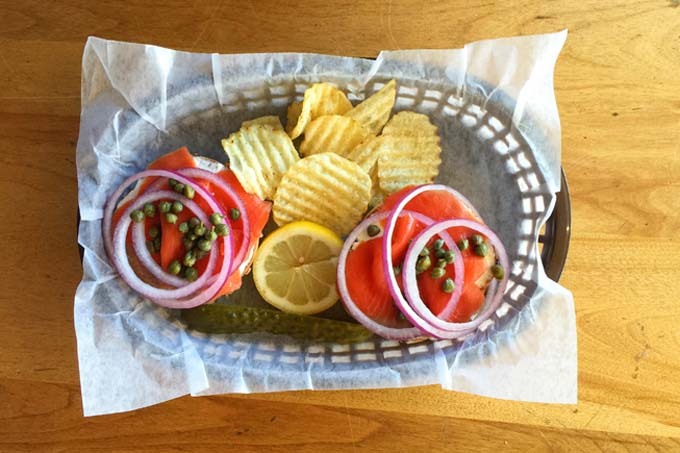 It was made of BC wild salmon lox on cream chese topped with capers and onion rings. I love the mix of the salty-sugary taste with the cream cheese. 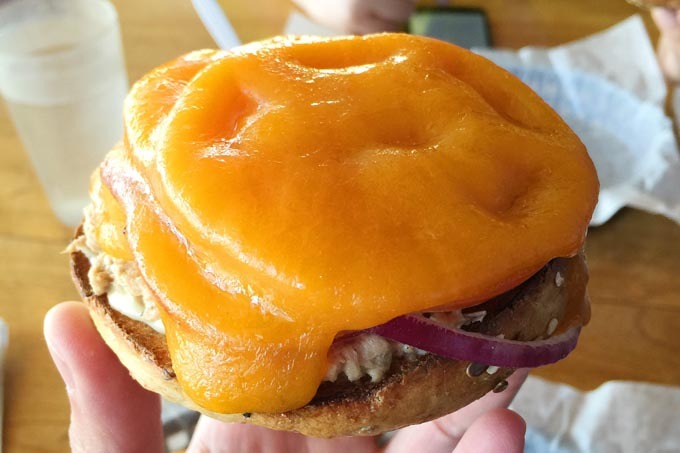 The tuna melt had cheddar melted over tuna salad on a bagel. The amount of melted cheddar looked impressive and the tuna salad was pretty good. 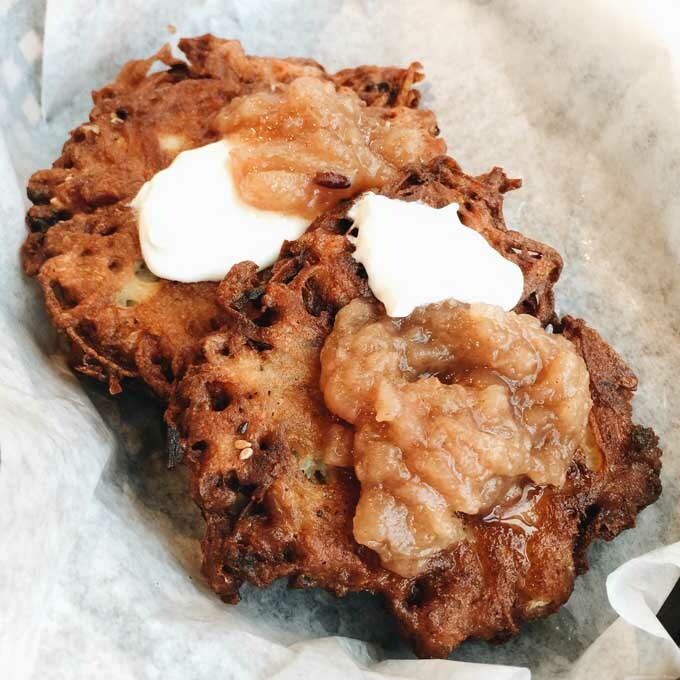 On one visit, I tried the latke special consisting of three latkes (fried potato pancakes) with Solly’s homemade apple sauce. They were soft on the inside, and golden and crunchy on the outside. It was a bit too greasy for my liking, but dabbing off some oil made it much better. Solly’s Bagelry has highchairs and booster seats in the dining area that you can help yourself to. They even have a small area with toys to help entertain kids. The inside of the restaurant has an overall relaxed and Bohemian feel. There are quite a few tables indoors and there is also a patio setup so that you can enjoy your food outside on a sunny day. Solly’s has such a large number of products along with their regular deli counter that it feels more like a mini supermarket. There are still many items that I would like to try. 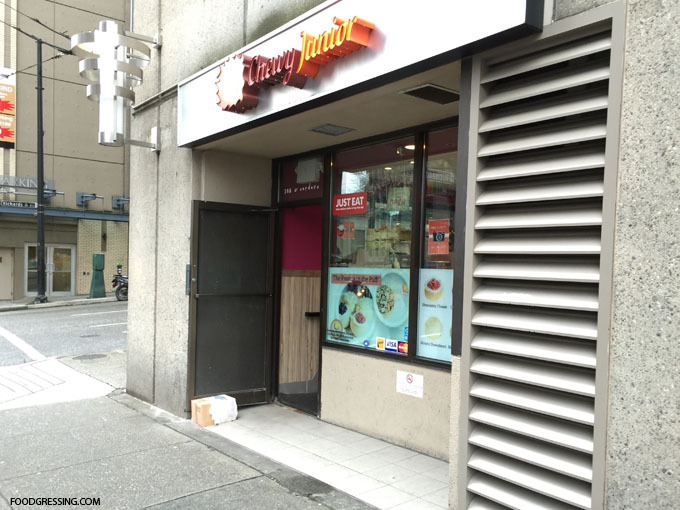 With two other locations in Vancouver (Main and Kitsilano), I’m looking forward to my next Solly’s Bagelry experience. 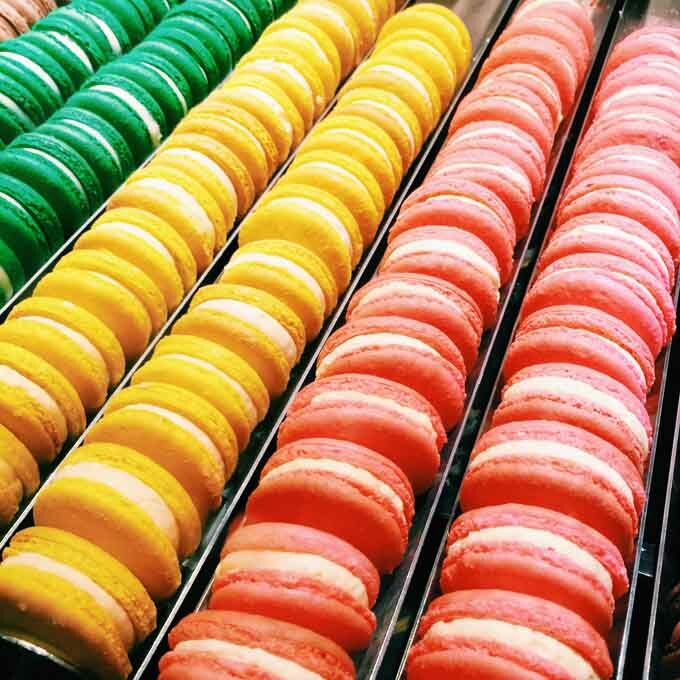 You can’t buy happiness but you can buy a macaron. Last Friday, maracon lovers in Vancouver rejoiced in celebration of Macaron Day. When you bought a macaron at a particpating bakery, you got to support a local charity. Way to spread to happiness! 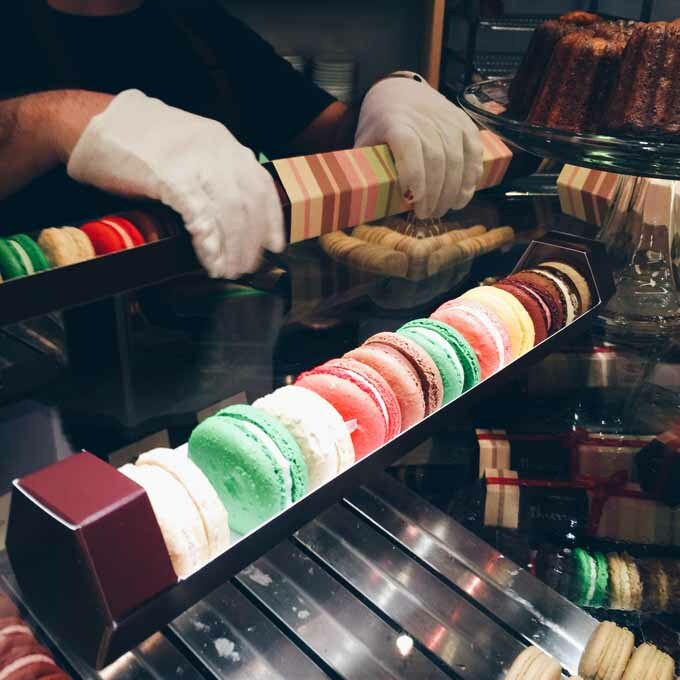 At Thierry Chocolate Patisserie Café, 10 percent of all macaron sales that day were donated to St. Paul’s Hospital. The macarons were at $2.25 each. A 7-pack was $14.75 and 12 pack was $24.45. The regular flavours were available: chestnut, coffee, maple pecan, pink praline, coconut lime, lychee, and cassis. When I went to Thierry in the early afternoon that day, it was very busy. There was a lineup of people waiting to buy macarons and lots of them. People were buying packs of macarons at a time and the macarons were disappearing quickly! Fortunately, the staff were bringing out fresh macarons to replenish the supply. It was pretty busy inside and rainy on the outside. 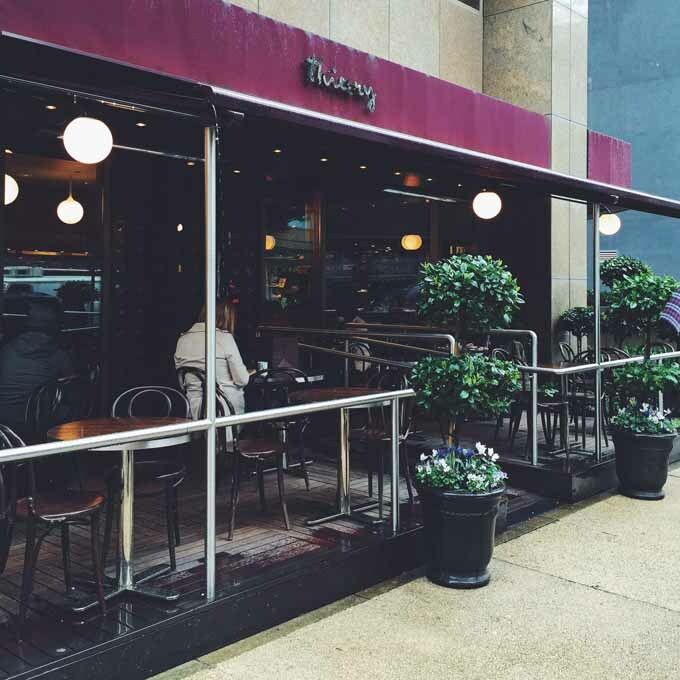 The patio at Thierry would be nice on a dry day. It was a good thing that macarons can brighten up your day! 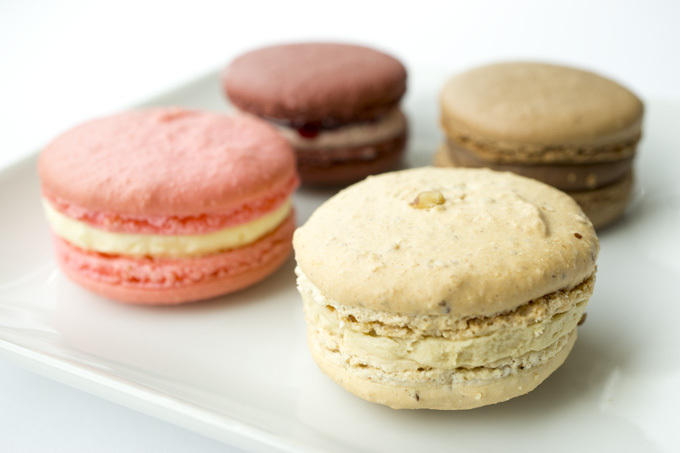 The Thierry macarons are fresh and large and are perfect indulgences. This cafe is definitely one of my go-to places for macarons in the city. I enjoyed the maple pecan one the most. It’s just simple and light. The lychee one comes a close second, which I think has some raspberry in it. It added some interesting texture to the macaron. Do you celebrate Macaron Day? 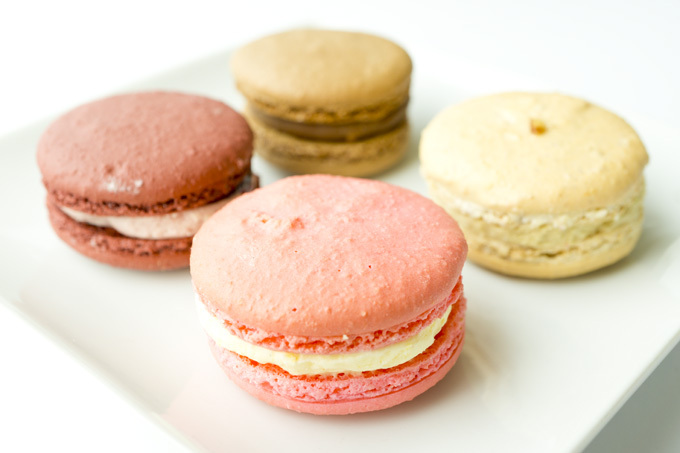 What macaron flavours do you enjoy? 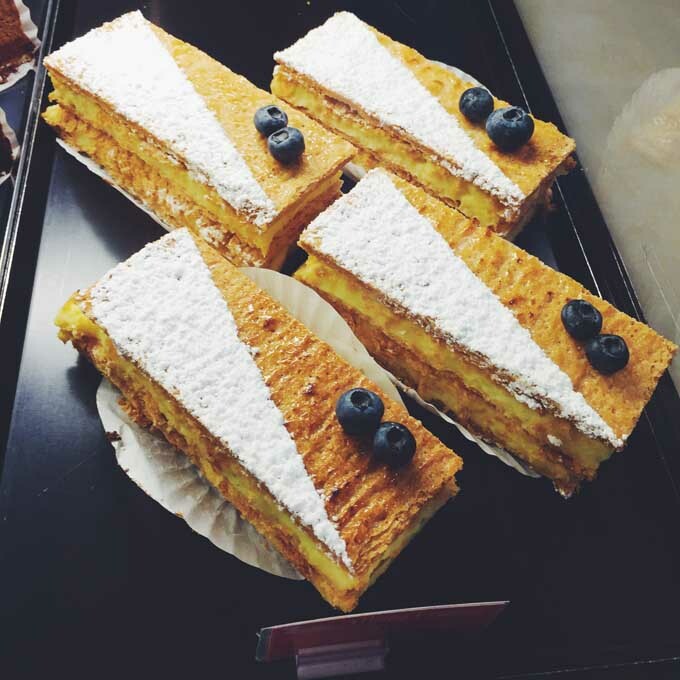 Sometimes, you just need a French pastry to brighten up your day. When I am in the West End, I head to Baguette & Co for that. 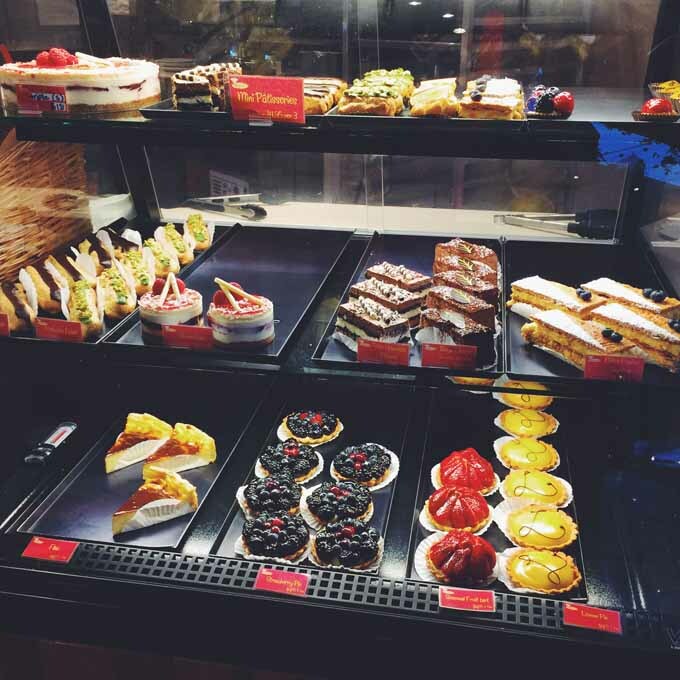 Pastries, bread, cakes and croissants – they are all eye candy in the display case and satisfying to the sweet tooth. The photos in this post are accumulated from several visits. 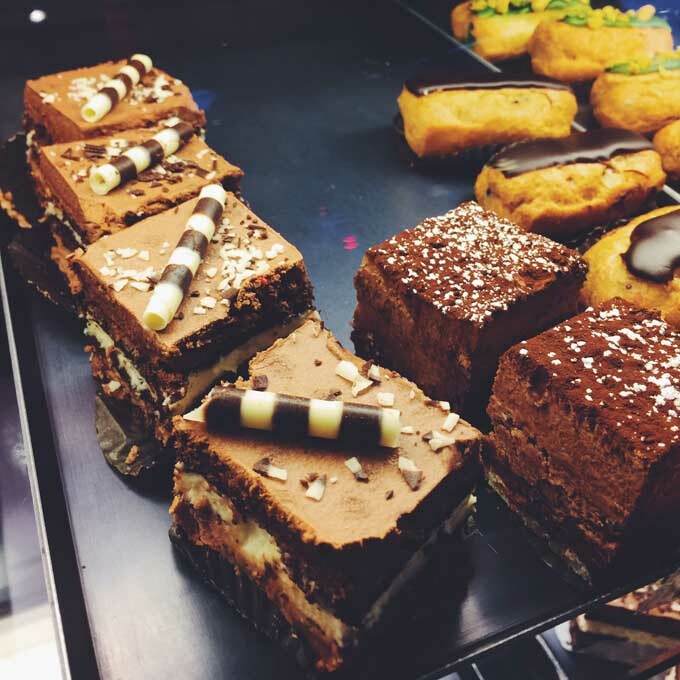 Sometimes, I just get hypnotized by the beauty of pastries. 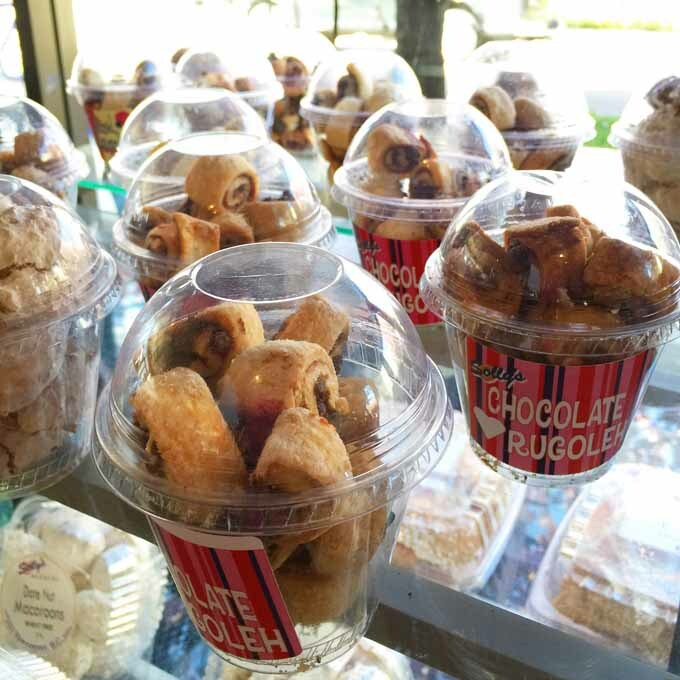 Baguette & Co has a nice selection of these mouthwatering and pretty sweet treats. 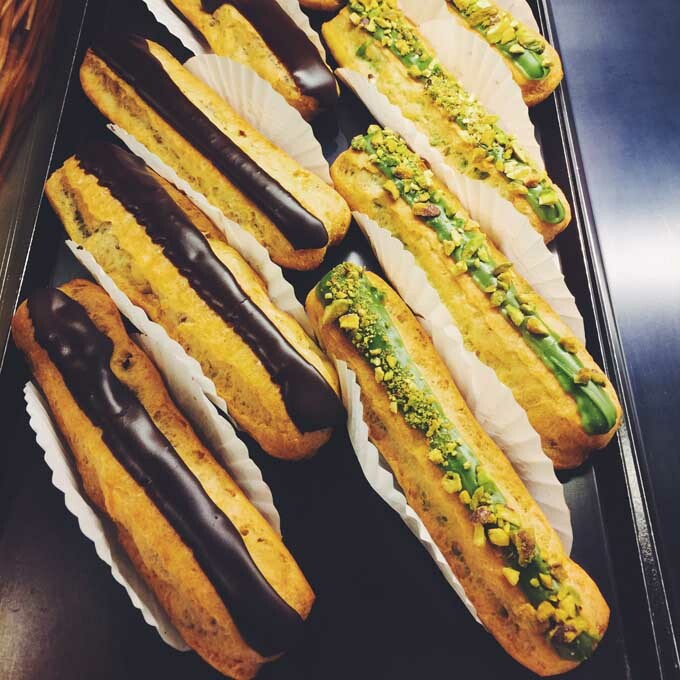 There are chocolate and pistachio eclairs that have custards rather than whipped cream or cheap vanilla custard fillings. French style apple pies are presented as a tart. The apricot tarts have a beautiful glaze. 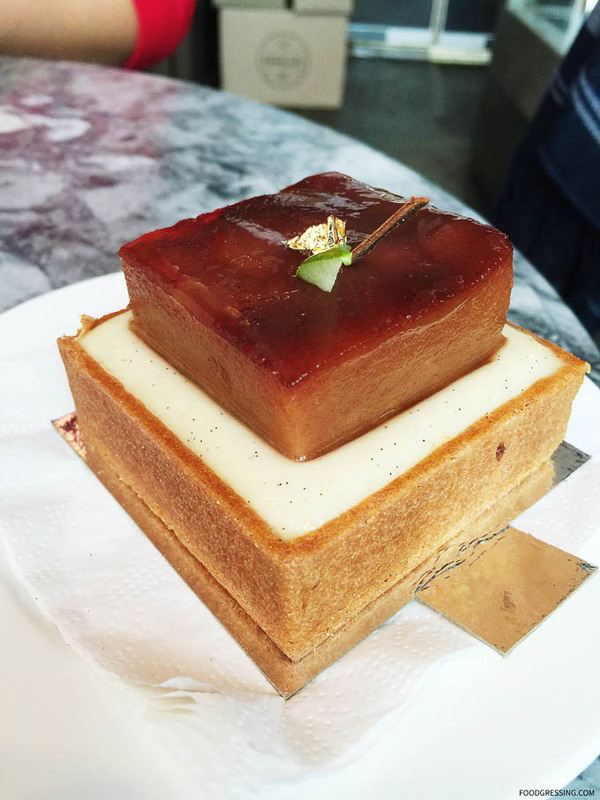 Milles-feuilles (also known as Napoleon) is a classic French pastry. Flaky pastry sheets with vanilla custard is a bit a heaven. 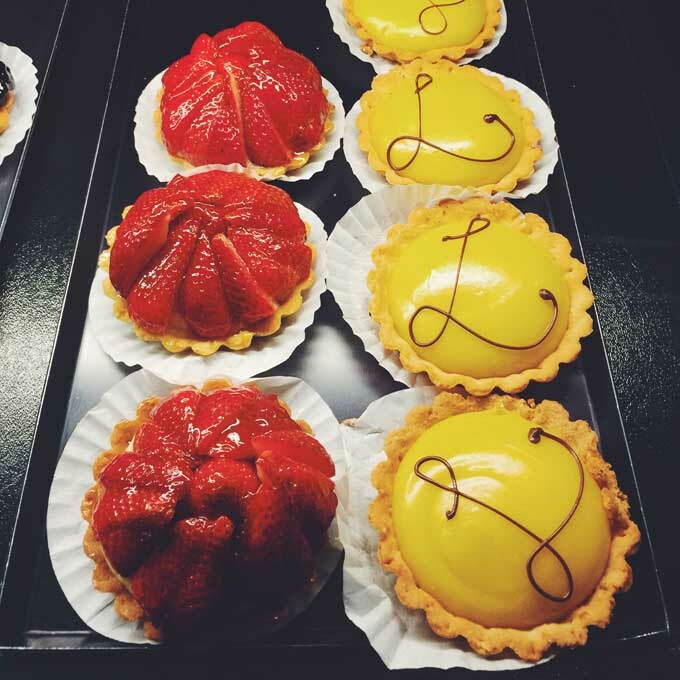 Strawberry and lemon tarts are available if you are in the mood for something fruity. 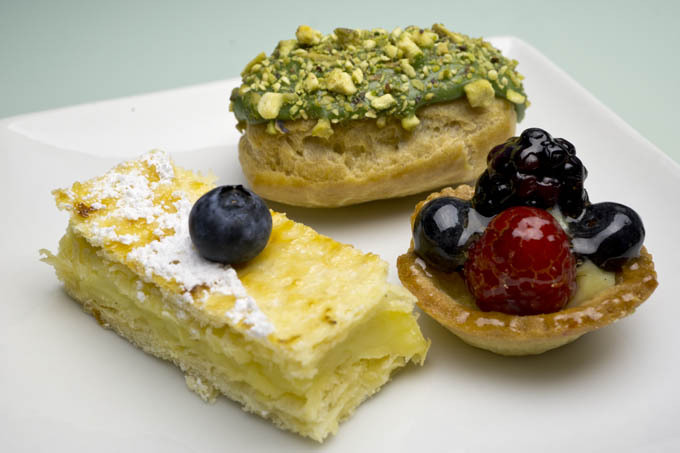 You can try mini pastries if you have a small sweet craving or want to sample the pastries. 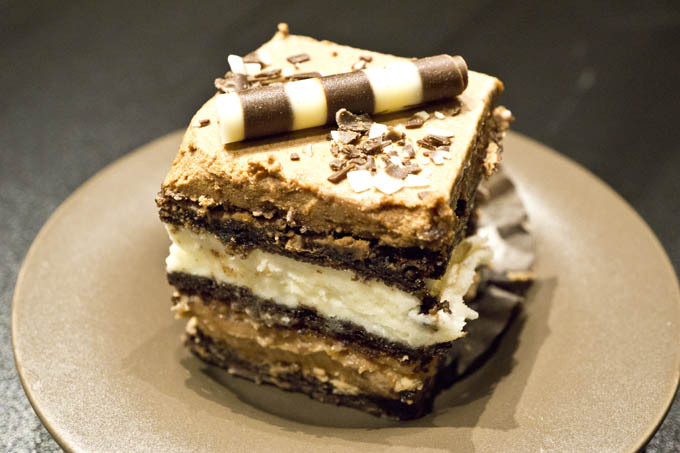 I really loved the mini tripe chocolate cake – it was definitely a chocolate explosion in my mouth. I also have enjoyed the milles-feuilles, seasonal tart and pistachio eclair. The napoleon had a very flaky exterior. The fruits on the seasonal tart were fresh. The pistachio eclair had a nice light custard filling. 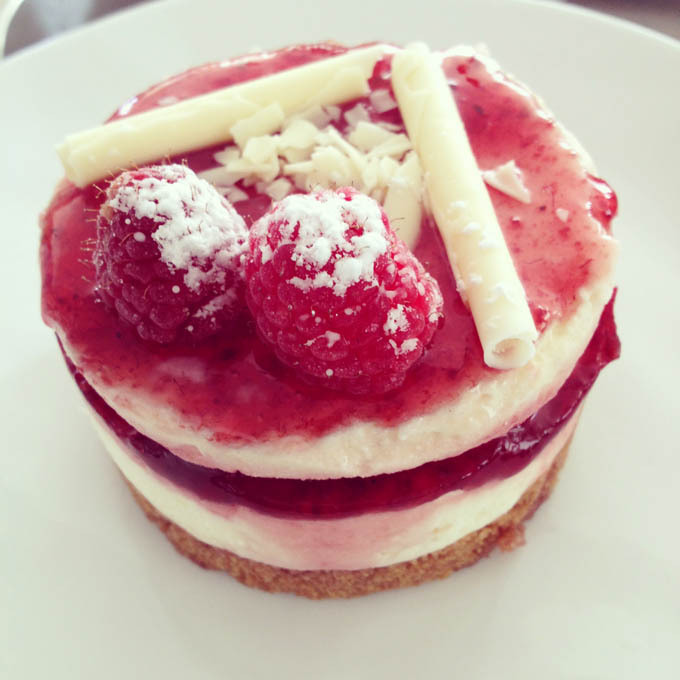 French cheese cake? Yes, please. 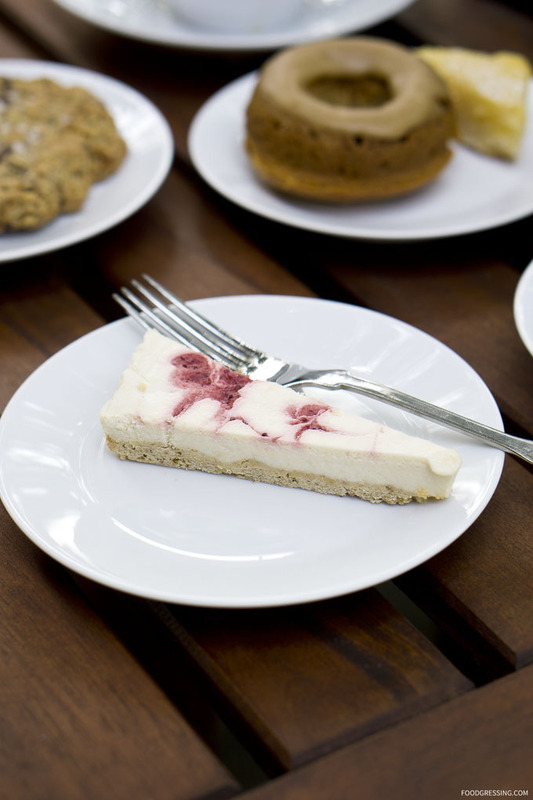 This cheese cake is soft and creamy in the centre and is very addictive. 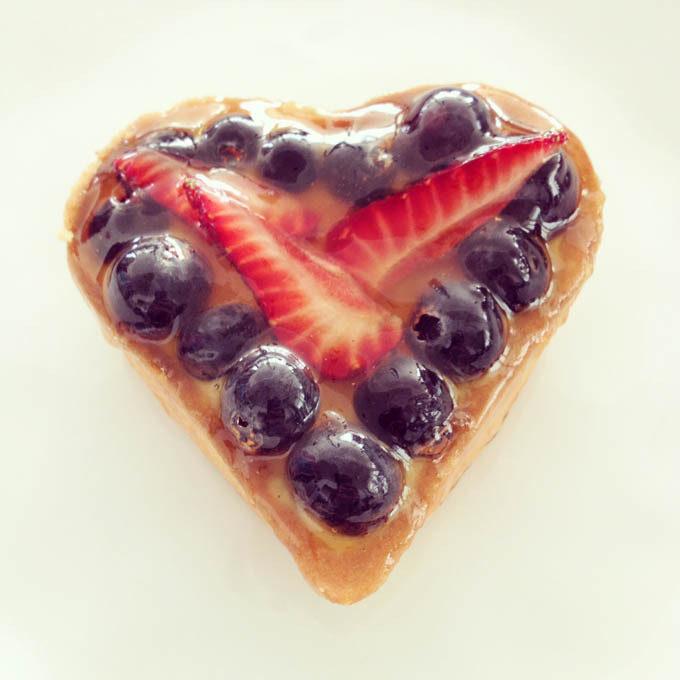 The seasonal fruit heart tart for Mother’s Day last year had fresh fruit and a tender and flaky crust. 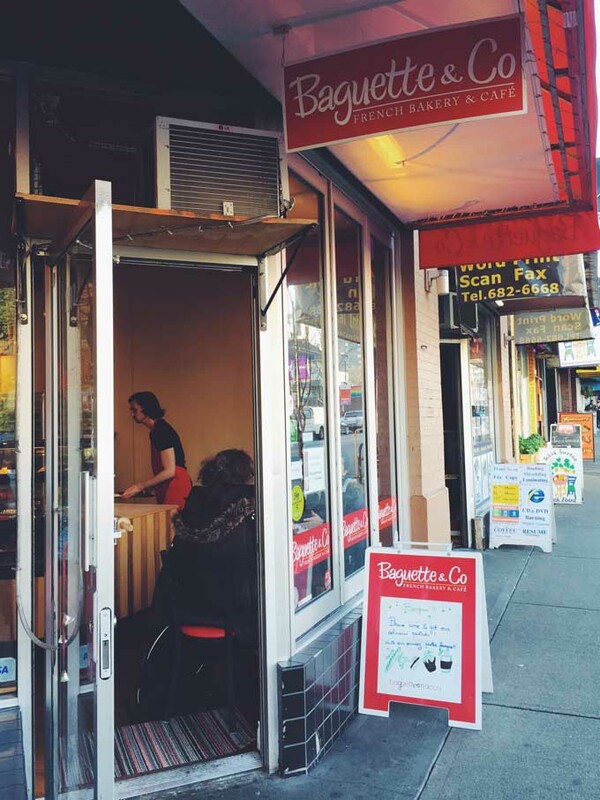 Baguette & Co has three other locations on West Broadway, Main Street and Marine Drive. 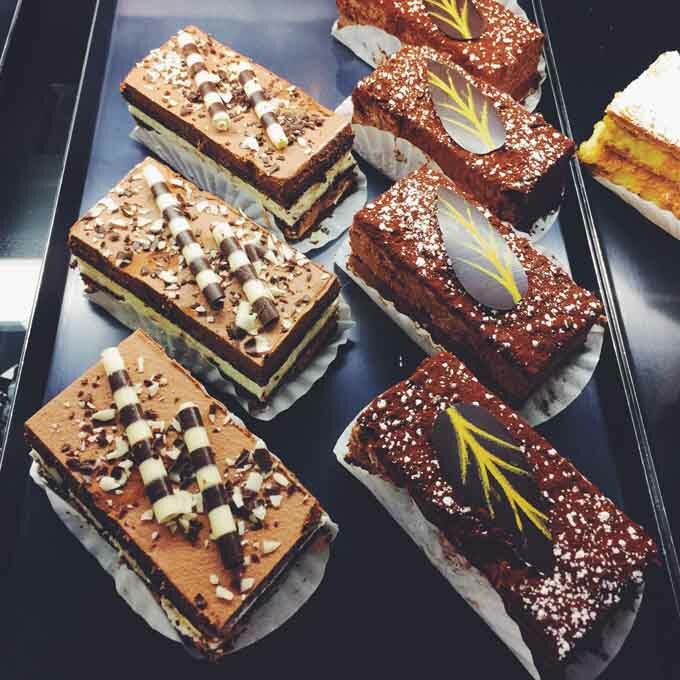 For some French delights in our city, consider popping by one of their bakeries! If you are around the Sunset Beach area, you’ll find people walking their dogs, locals going for a stroll, tourists enjoying the view and joggers on the move. 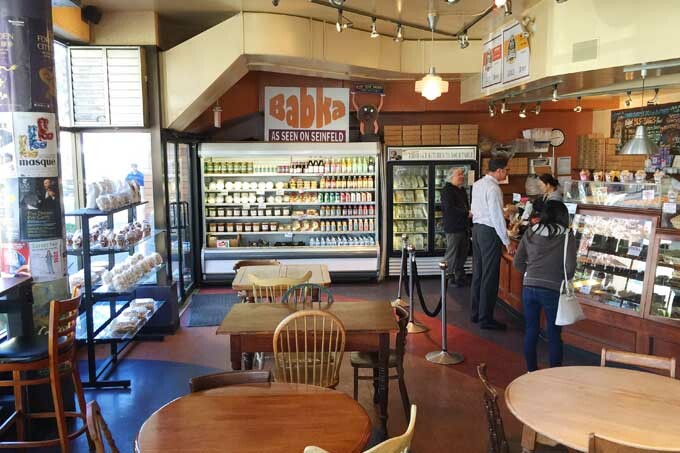 You’ll also find these folks taking a break and enjoying eats at the neighbourhood bakery, Tartine Bread and Pies. 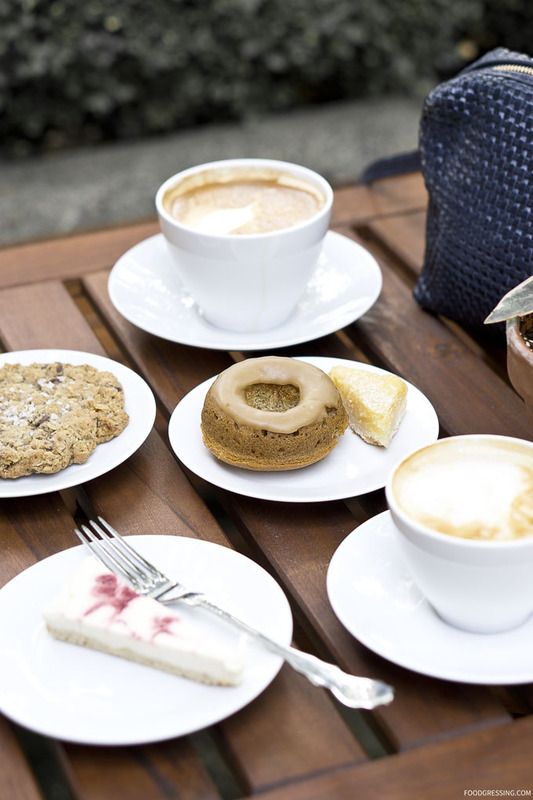 Located on Beach Avenue and close beneath the Granville Street Bridge, Tartine has a selection of homemade style baked goods. It is a small cozy cafe with limited seating indoors and outdoors. I have gone to there a few times and enjoyed their food while sitting at one of their tables outside with my dog. 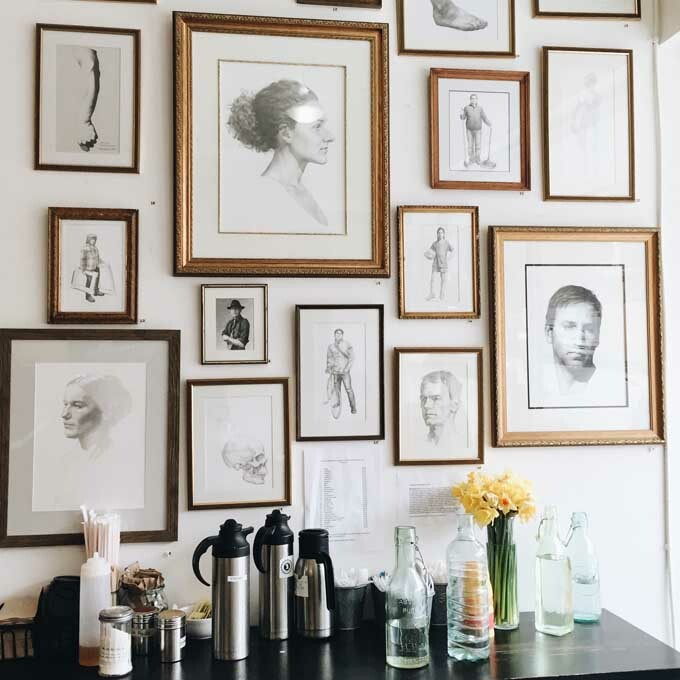 There are interesting framed art pieces in the area where you get your sugar and creams. You can help yourself to some water. Cinnamon raisin bread pudding sounds like homemade deliciousness! 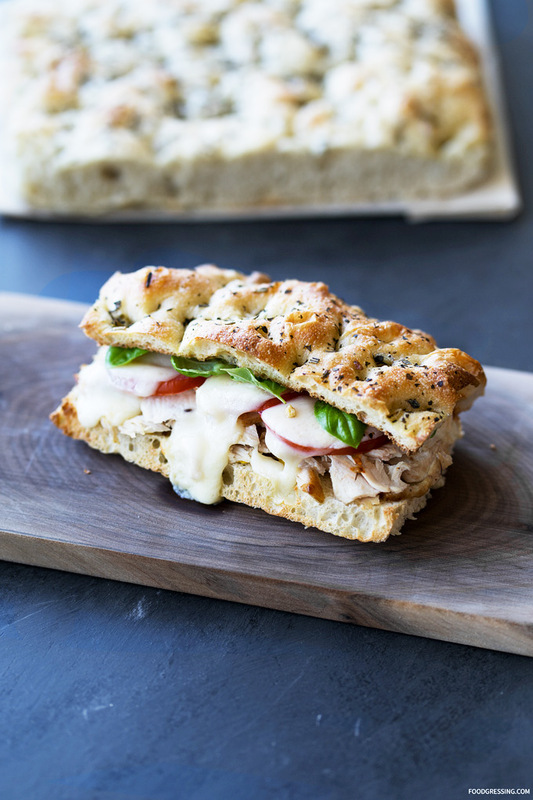 Tartine is most famous for their tarts and pies, but they do have sandwiches and soups on their menu as well. I have tried their butter tarts on a few occasions. The tarts have a nice buttery shortbread crust. 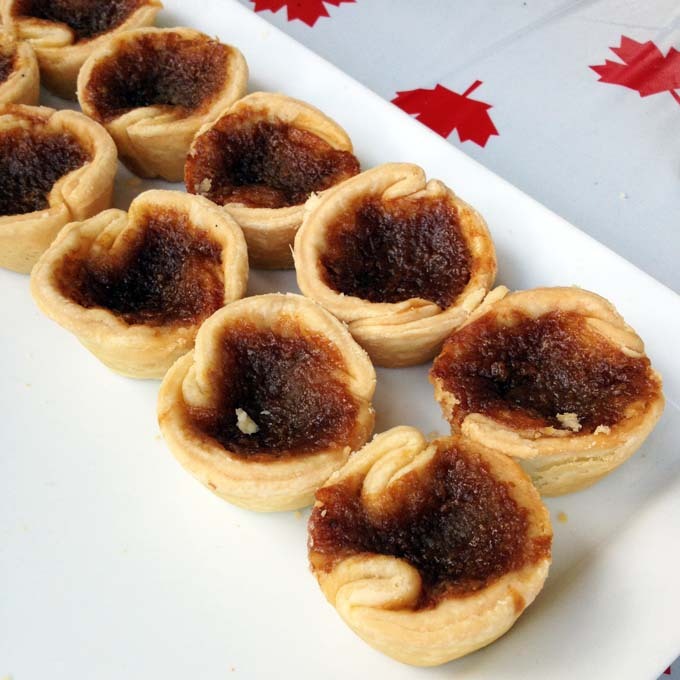 Here is a throwback photo from last year of when they had a Canada Day celebration where they offered their butter tarts for free! 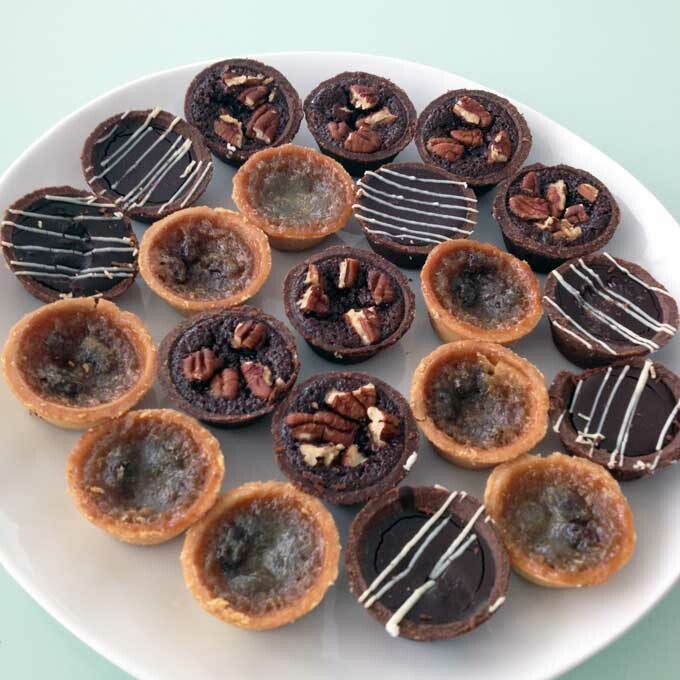 I have also bought pecan and butter tarts for my work place. A few of my colleagues are fans of Tartine so the treats were well received. The lady put them in a box and I just nicely presented the tarts on my own plate. 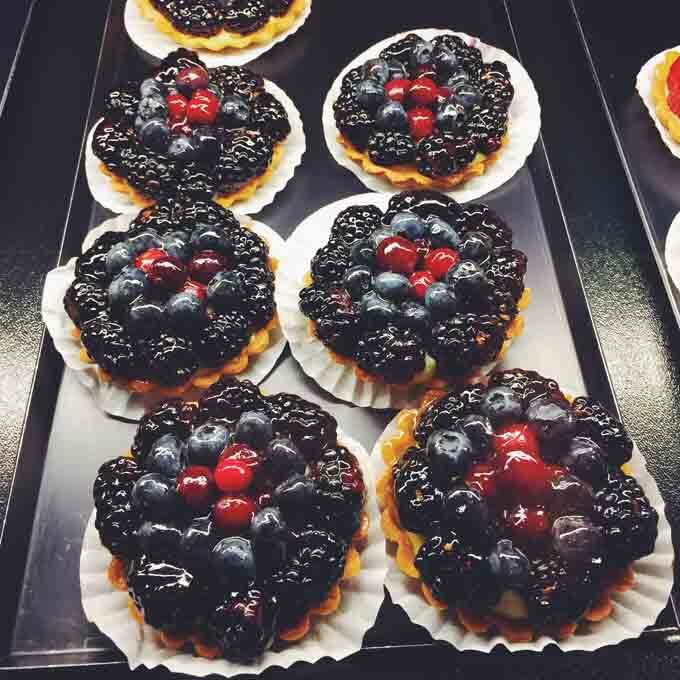 The tarts definitely have a homemade goodness to them. The tarts were under $2 and were a nice afternoon indulgence. 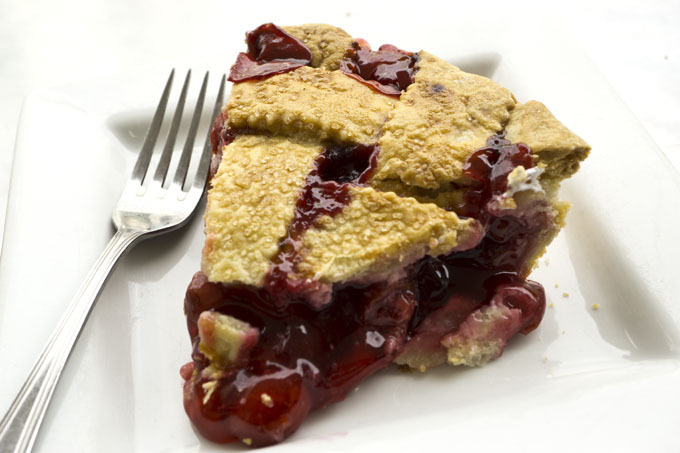 Of the pies, my favorite is the sour cherry pie. 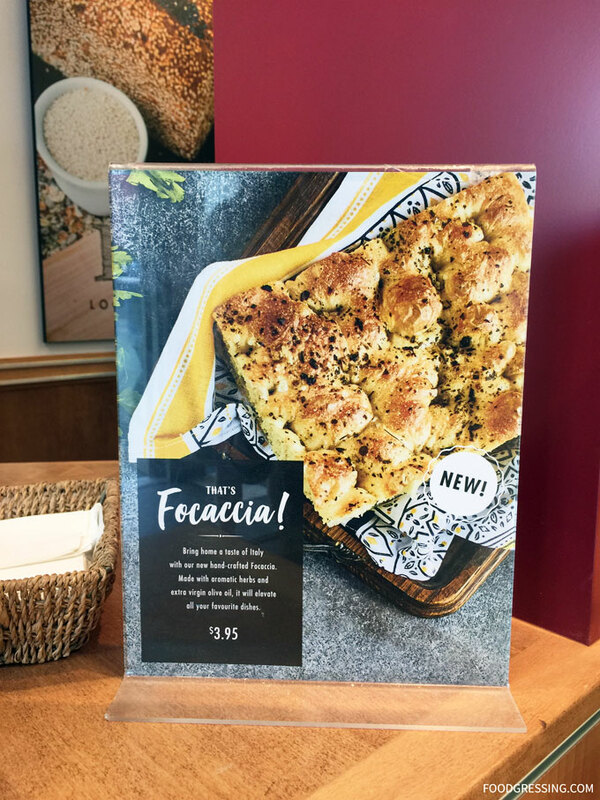 It has a delicious flaky lattice crust. A slice of pie is $3.95 and whole pies are $20. 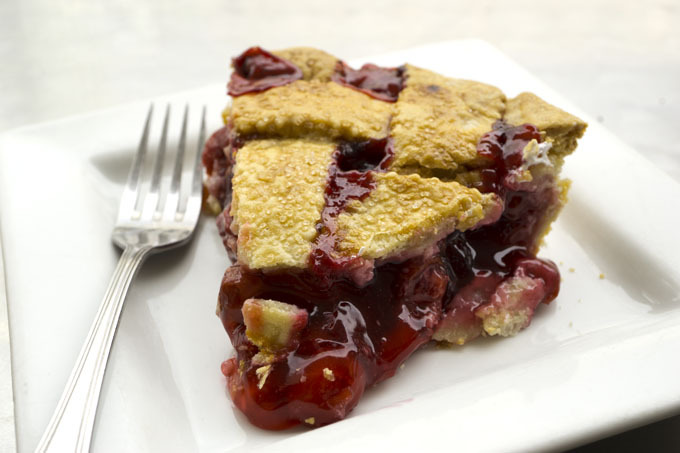 A list of pie flavors is available on their website. 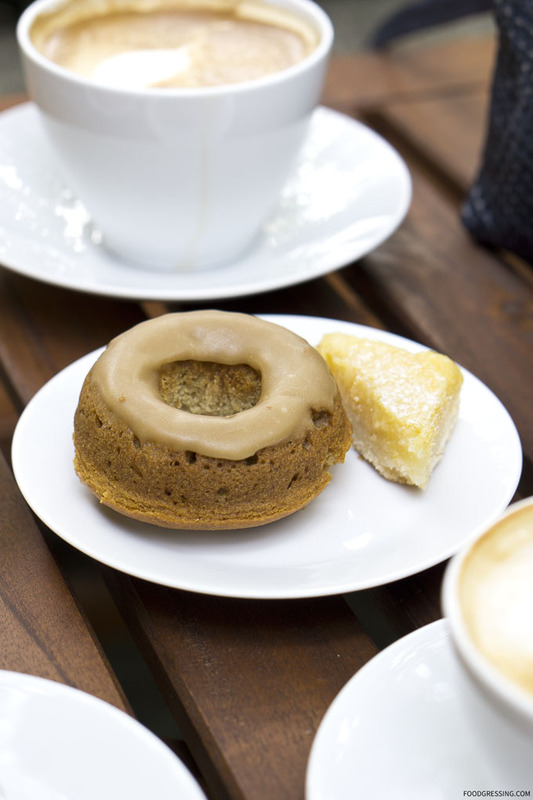 If you are in the area and are in the mood for sweets, stop by Tartine for some homemade sweet eats! 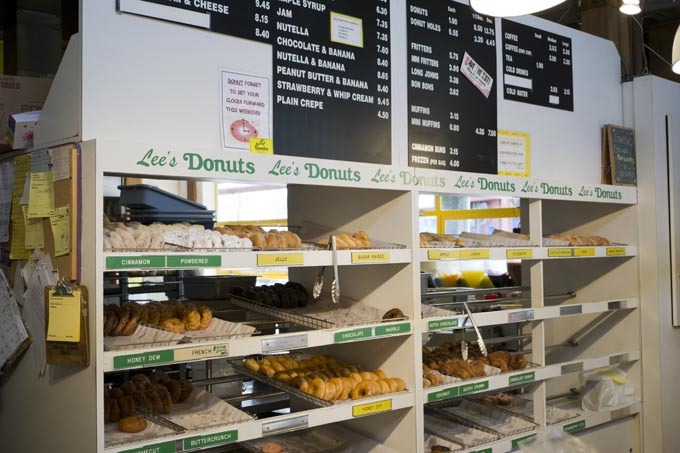 Lee’s Donuts on Granville Island has been around for over 35 years. Such longevity can be attributed to their yummy donuts enjoyed by tourists and locals. 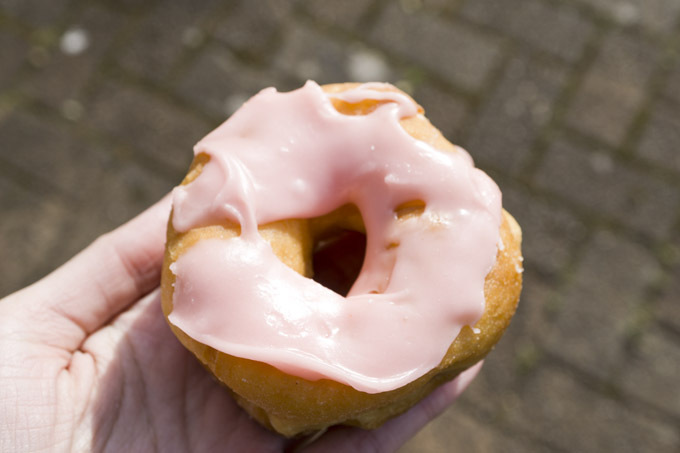 $2 can get you fresh made donut, which seems like a great deal at a touristy place like Granville Island. 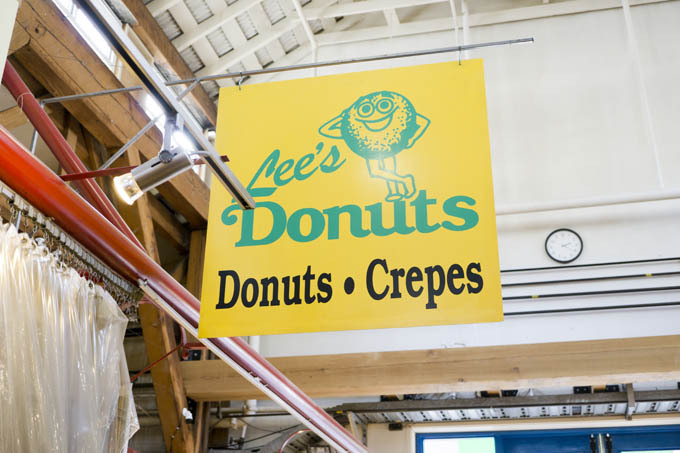 Lee’s Donuts is located inside the Granville Island Public Market. There always seems to be a line when I go there. I find myself waiting with a mix of tourists and locals which is interesting. Aside from donuts, they also have crepes, fritters, long johns, and muffins as well. On our Granville Island trip today, we went for chocolate sprinkle and strawberry donuts. They both had delicious icings, a nice crunchy texture on the outside with a fluffy softness inside. The best thing is that they are not *overly* sweet. 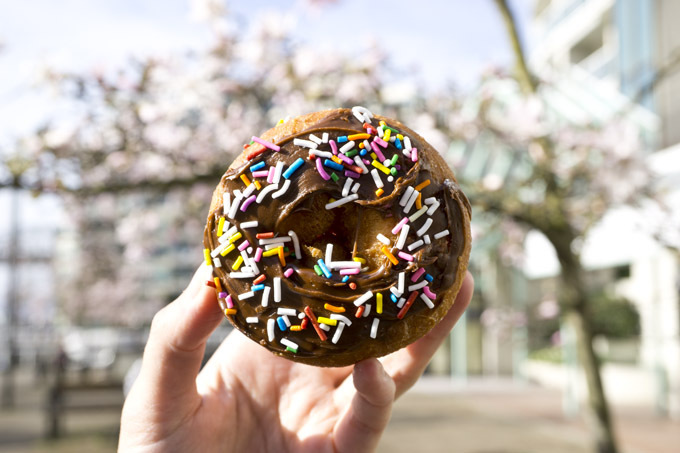 Afterwards, we took a Granville Island Ferry back to Downtown Vancouver and I played around with some donut-tography. 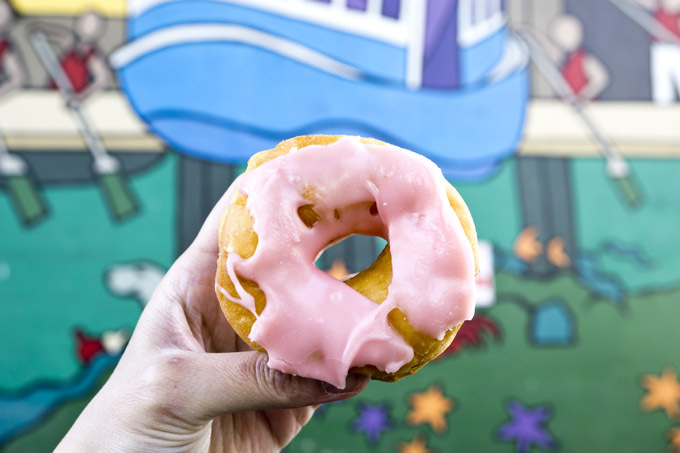 Lee’s Donuts make great affordable snacks while you are strolling around Granville Island. The most popular donut is the honey glazed. There is a great selection of donuts so there is likely something for everyone!